A piece to continue the arc from The Bringer of Light. 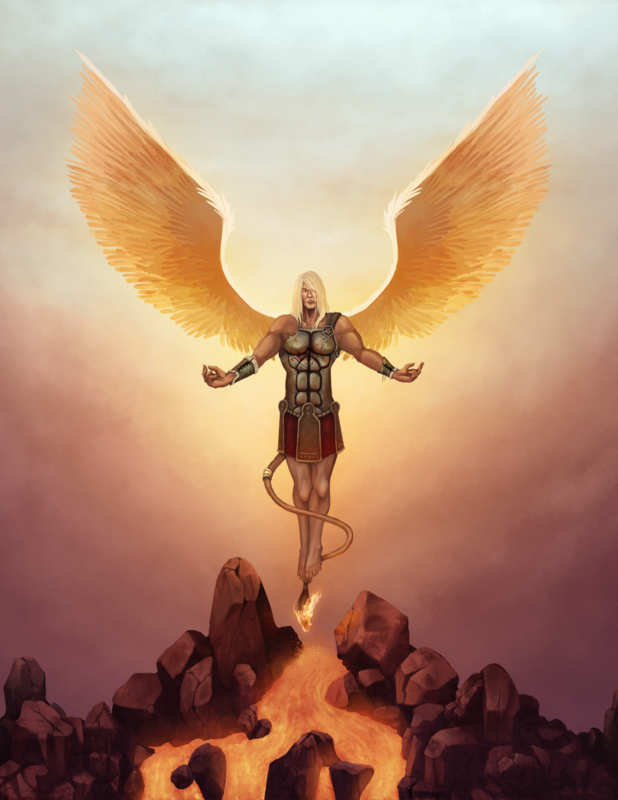 Lucifer, despite his fall and condemnation, is defiant, and struggles to take his place in the heavens. I've always admired the Satan-figure in Islam, at the time of his fall; Iblis, who refused to bow to any but God himself. The lion's tail serves as a symbol of his pride and unwillingness to concede, and the flame alight at its tip reflects the gradual deterioration of his spirit. Before long, he will accept his fate, and his love and loyalty will be replaced by hatred, and a thirst for vengeance. This is probably the biggest piece I've ever attempted, and I'm proud to say that my laptop stood up to the challenge. Numerous crashes occurred at first, when I was working on the background (the filesize hit a peak of just over 850mb). After flattening some layers, however, the troubles disappeared. The piece was approximately 6500px by 7000px, cropped later to 5500px by 7000px.